Juventus and Real Madrid go head to head in the 2017 Champions League final and William Hill is offering enhanced odds on the big match! Claim 5/1 Real Madrid or 6/1 Juventus to win the trophy! Exclusive offer! 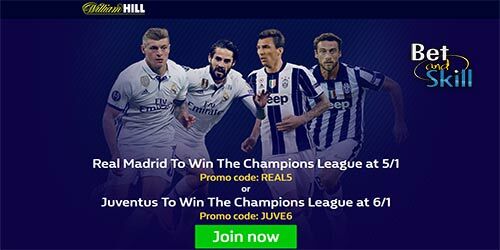 The 2016/17 Champions League Final will be contested by Juventus and Real Madrid on Saturday, June 3 and there is an unmissable betting offer at William Hill! Find below how to get 6/1 for Juventus to win the cup or 5/1 for Real Madrid to win the cup! If your selected team lifts the cup, William Hill will adjust your account within 24 hours to reflect the enhanced price! New UK customers only. Neteller and Skrill not accepted. Open a new account using promo code REAL5. Place a £10 bet on Real Madrid to lift the trophy in the Champions League final at current odds and receive a free £10 bet at enhanced odds of 5/1. Enhanced returns paid as free bets. Open a new account using promo code JUVE6. Place a £10 bet on Juventus to lift the trophy in the Champions League final at current odds and receive a free £10 bet at enhanced odds of 6/1. Enhanced returns paid as free bets. Terms and conditions REAL5: 1. Place £10 or more on Real Madrid to lift the trophy in the Champions League final before kick-off, (3rd June 19:45) at the on-site odds. 2. William Hill will then pay out £10 of your stake at 5/1 in free bets if Real Madrid lift the trophy. e.g. Bet £10 on Real Madrid at 13/8 (example odds). If they win, your bet returns £26.25, and your account will be topped up with £33.75 of free bets for the additional winnings. 3. Offer valid to UK customers only. 4. Qualifying bets are those placed on the To Lift The Trophy market only. 5. If Real Madrid fail to lift the trophy, we will credit up to £10 back as a free bet. 6. This offer is only available to new William Hill customers who open an account using the valid REAL5 promo code. Terms and conditions JUVE6: 1. Place £10 or more on Juventus to lift the trophy in the Champions League final before kick-off, (3rd June 19:45) at the on-site odds. 2. William Hill will then pay out £10 of your stake at 6/1 in free bets if Juventus lift the trophy. e.g. Bet £10 on Juventus at 19/10 (example odds). If they win, your bet returns £29, and your account will be topped up with £41 of free bets for the additional winnings. 3. Offer valid to UK customers only. 4. Qualifying bets are those placed on the To Lift The Trophy market only. 5. If Juventus fail to lift the trophy, we will credit up to £10 back as a free bet. 6. This offer is only available to new William Hill customers who open an account using the valid JUVE6 promo code. 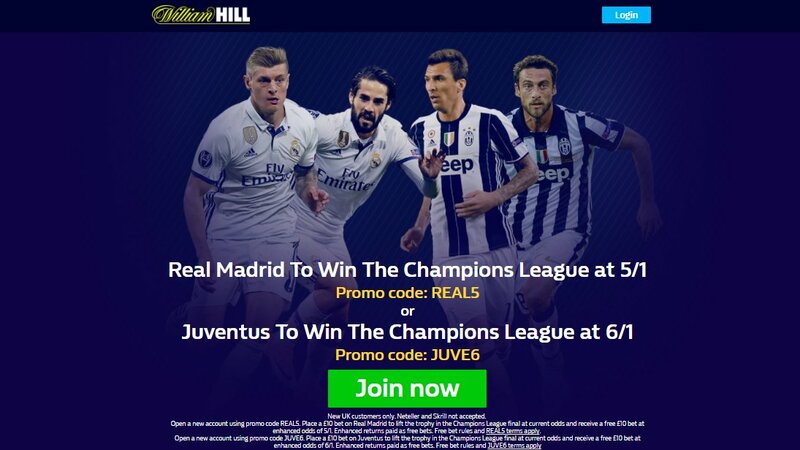 "Get 5/1 Real Madrid or 6/1 Juventus to win the cup at William Hill (Champions League Final offer)"